Where is psychology’s role in the aftermath of major disasters? This was the question posed at a recent British Psychological Society Crisis, Disaster and Trauma Section conference which included talks on the part played by Family Liaison Officers following the Shoreham Airshow crash and the deep psychological impacts of flooding. Pete McCarthy, a European Association for Aviation Psychology human factors specialist, who has also worked for 25 years as a helicopter pilot, witnessed crashes and lost colleagues in the early parts of his career, and he started to look to psychology to find out why people make mistakes. McCarthy, now an academic at Cranfield University who has also worked within air accident investigations, said aviation relied on psychology to train its people. In the early days of aviation accidents tended to be blamed on technology, but with improvements now humans often carry the can. Rather than attributing blame, McCarthy said, it’s important to understand what was different for those pilots on the day of the accident compared to other days. Humans can often be the saviours when accidents or faults do happen – remember the pilot who successfully ditched in the Hudson River – so as McCarthy summed up, all the things which makes humans fallible often makes them brilliant. As an investigator, McCarthy has to understand how memory, attention, human information processing, perception, behaviour, personality, and situational awareness can go awry. Increasingly these days, he added, we have to consider the human-technology relationship – pilots tend to be monitoring systems rather than actively working with instruments, and this can lead to complacency. Culture is essential to understanding accidents as well: McCarthy said the behaviours of pilots are driven by deep-rooted beliefs and attitudes which can have positive or negative impacts on safety. For example, the response to the Fukushima nuclear meltdown has been blamed on a traditional Japanese ‘deference to authority’ making the situation worse. This increasing focus on the human in air accident investigations has benefitted the aviation community in a ‘big way’ McCarthy concluded. If we just concentrate on the technical causes of a crash we can understand what happened and how, he said, but if we think about psychology and human factors we understand why it happened. In a heartfelt talk Detective Constable Louise Pye described her work as a Family Liaison Officer in the aftermath of the Shoreham Airshow Crash in August 2015, which killed 11 men. She and 23 fellow officers are still working with the families and investigations into the incident are ongoing. Although officers who voluntarily work as Family Liaison Officers (FLOs) are very highly trained, Pye said they still were not ready for the disaster. In the first hour following the crash, Pye assembled a team of FLOs who were ready to speak to families. However, she said, there was a careful balance in speaking to families between speed and accuracy. In a disaster like this identification of those who had died took time and police could only provide families with the facts. She said the incident had tested the team to its extremes in many ways – while all capable officers in their day jobs, many were anxious about whether they could do a good enough job in this case. Pye said that in speaking to families, even if they had a vehicle that had been burnt out, they could not say the person had died without forensic evidence, DNA, and knowledge of what that person was like in life. It is incredibly hard for families to wait for this information: Pye said that people can’t begin the healing process until they know the truth. Further complicating matters was media coverage – social and conventional – showing the crash and its immediate aftermath. Pye said Shoreham, a small place with good community spirit, truly felt the impact of the disaster – many knew someone who had died, or had been in the area at the time. Officers also worked in supporting the community as well. Each of the families affected are still working with the FLO they originally came into contact with, and where there was a choice – for example whether to visit the accident scene – Pye said families were given it. This went as far as to the property of loved ones. Families were asked whether they would like the personal effects, whether they’d like them cleaned or not, and these were delivered in a memory box to be opened when the family was ready. The FLOs in this case worked full-time with families for four weeks and have been working with them ever since. Each devoted huge amounts of time and energy, and Pye said it was a struggle to encourage officers to take time out for themselves in the first few weeks following the disaster. Officers were also encouraged to write things down to be discussed in the eventual debrief throughout the entire process of working with families. 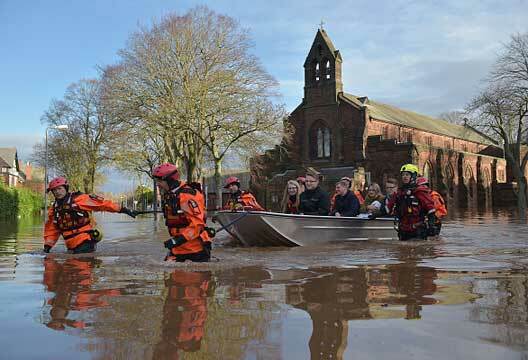 Dr James Rubin (Kings College London) has been looking into the psychological effects of flooding as part of a partnership between King’s College London and Public Health England, the National Institute for Health Research Health Protection Research Unit in Emergency Preparedness and Response. He explained that flooding has a much deeper impact on those affected than we’d usually think: not only has water entered their houses but many are left without the ability to go to work or school, and local health services can be affected as well as a community as a whole. In one study he and colleagues looked at the effects on flooding between three and six months on, following the 2007 summer floods – the wettest summer since records began. Collecting more than 2000 survey responses from people in South Yorkshire and Worcestershire, Rubin’s team found high levels of distress, anxiety, depression and PTSD in people whose homes had been flooded. The level of the water in the home even made a difference, with higher chances of being distressed if the flood water reached above the skirting boards compared to those who had water below that level – although all are at higher risk of distress compared with controls. In a later study following the flooding around Christmas time in 2013 (the wettest winter in 250 years), Rubin and colleagues, as part of the ongoing English National Cohort Study of Flooding and Health, looked at how the psychological effects of flooding linger. Again more than 2000 people responded to in-depth surveys, revealing that mental health problems are still very high a year after flooding. Similarly to the first study the level of water, the duration of flooding and whether a person was evacuated all exacerbated these effects. Rubin suggested these results show that the psychological effects of flooding are significant and could affect large numbers of people – it could be important for healthcare professionals to know if a person has experienced flooding, in order to understand their needs fully. There is also scope for intervention: if water depths in a person’s home can be prevented from rising above a certain level, this could decrease the risk of a person experiencing psychological problems later. - Read our interview with Dr Noreen Tehrani, Chair of the Crisis, Disaster and Trauma Section.